On Friday, Navy Secretary Ray Mabus took a break from his desk job to take part in the greatest American pastime: baseball. 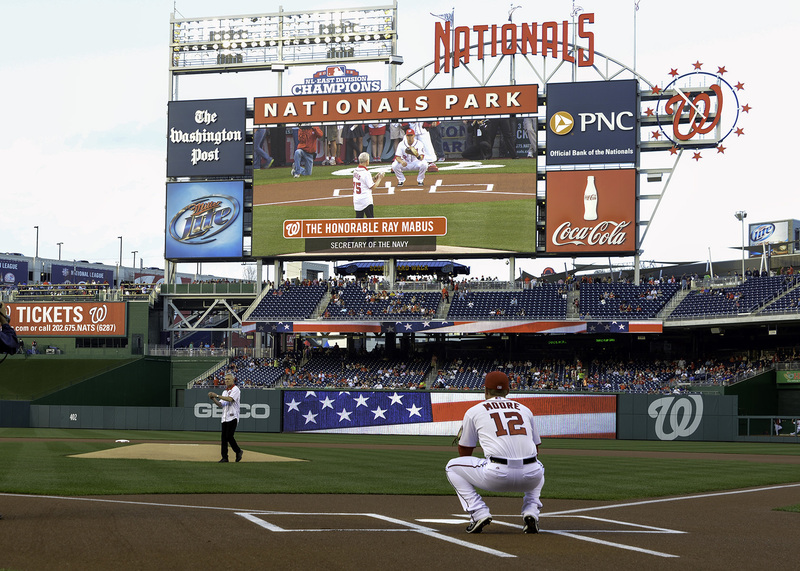 Mabus threw out the ceremonial first pitch at the April 12 game between the Nationals and the Braves in Washington, D.C. The game was the Nationals’ annual Navy appreciation game. All five services will have a game played in their honor during the 2013 season. The Coast Guard’s will happen Aug. 5. The Braves won the Friday night game 6-4 in 10 innings. Prior to taking the mound, Mabus administered the oath of enlistment to 11 sailors at the stadium. This wasn’t the first time Mabus put his baseball skills to the test. He also threw out the first pitch at a San Diego Padres game in September 2012 and a Milwaukee Brewers game in September 2011.